I saw these "Fried Egg Flowers" at the Fullerton Arboretum yesterday. I saw them on Ebie's post, from the Main Ingredient, last week and had to get to the arboretum to see them for myself! 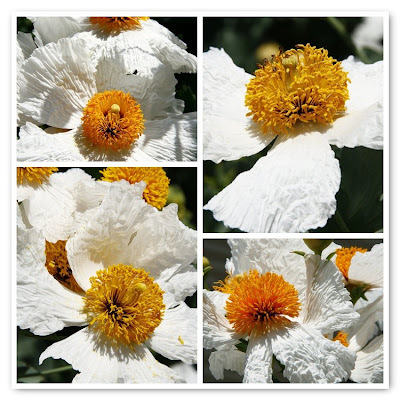 These flowers are also known as the Matilija Poppy. They like to reach for the sky! These are growing on three sides of this building. I am not sure why they can be called "Tree Poppies" when they grow as a shrub. They can be found on hillsides in coastal canyons in Southern California and parts of Mexico. These poppies or Fried Egg Flowers are so, so beautiful Carolyn. I like the delicate crepe petals and the vivid orange middle. Thanks for posting a picture of the whole plant, showing the shrub. I've never seen these flowers by us but I was looking for real poppies. Thanks for sharing your beautiful photos with us at Macro Flowers Saturday. I love this herbaceous plant of Romneya coulteri, just I have one in my garden with many flowers. Here we call it fried egg. (Huevo frito). Carolyn, I just took some pictures of these tree poppy myself. They are something else aren't they, the petals are so soft and silky like material. Those don't look real. The petals look like very thing crumpled paper. Great shots and thanks for sharing. I like this one wish it will grow up here in MI. Happy Sunday! Bravo, you did well, and better than my photos. Not at all Carolyn, I do not mind. It is my pleasure to share with you where I have been to, that's what blogging is all about. I just arrived from our picnic. They are just gorgeous flowers! I love your macro shot, and they do look like "fried egg". I have never seen flowers like these. They really look like fried eggs in terms of colors. That's a great name for them, the fried egg flower! A beautiful flower, and love all your photos. Thanks for sharing Carolyn, and have a great week. Lovely pictures all of them ! How unusual and they really do look like fried eggs. Lovely poppies, I have seen one yet in real life. 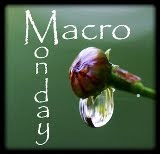 your macro shots are great. those flowers are truly like sunny side up eggs. lol.have a great day. Cetainly a stunner!They do resemble a fried egg!How about that Mother Nature!It's always wonderful to learn of new plants! What gorgeous blossoms! - we don't have this shrub where I live. So very pretty!!! It's like they're worshiping the sun. GLASS EYE - my link if you'd like to view my macro this week. The second shot with it's intense color is my favorite. We have a lot of these growing in the neighborhood - they seem to thrive on neglect. They have such a nice grayish green foliage and the flowers are stunning - love your photos! If you hadn't said their name, I would have guessed they were some kind of daisy! LoL! I really don't know the names of flowers, though, I just love seeing them! Beautiful poppies and the pictures were great. Have a wonderful weekend. i havent seen something like that yet but those are beautiful :) thanks for sharing! What a riot. The petals look like paper and the yellow fluff does look like an egg yolk. They really do look like fried egg flowers. LOL. Happy MYM. Carolyn, they are cool looking poppy flowers. i like the name too very fitting! Yes, they really do look like fried eggs! I've never seen them before. Very cool Carolyn! Oooh, these are such beautiful plants! I have never seen white poppies before. ABC Wednesday / "Q" and "P"
Photo Sunday / Happy Mother's Day, Julie!